This is a review of Quarq power meters which I’ve been using for the past six months. I bought the model Quarq Elsa. It weighs 735g. It was 85 grams lighter than the cheaper Riken model. The Riken has non hollow crank arms and a heavier spider. The Quarq Elsa cost me around £1,500 from local bike shop. 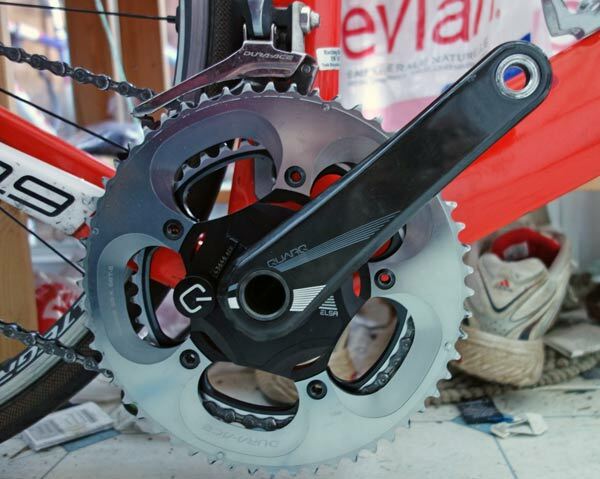 The Quarq power meters work by measuring the torque (pressure) applied to the chainset and crank * cadence. Torque is measured by tiny strain gauges, which measure how much pressure is applied. The power readings are relayed by ANT to a suitable power device. Much of the cost of the Quarq is the cranks themselves. If you already have a good crank, you are buying a surplus crank arm. It does make it quite an expensive power meter, especially with cheaper models coming on the market. To swap between bikes, you need to remove the crank arm and fit to the bottom bracket. This job is OK, if you have the right tools. In theory, I should be swapping the Quarq power meter between my road bike and TT bike quite frequently. But, in practise, I don’t want even that 10-15 minute job. So I just end up leaving it on one time trial bike. I like riding with a power meter, but not enough to religiously change it every time I swap bikes. 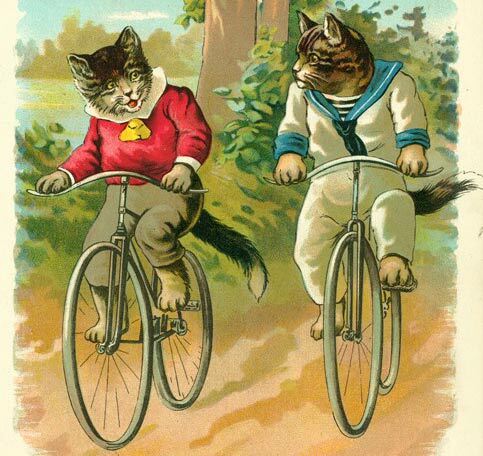 I’ve enjoyed writing a few recent posts, – the joys of the turbo, old school cycling e.t.c.. But, I promise this post will be really quite boring. It’s the inevitable post-power-meter-purchase-data-examination-and-speculation. – Something many power meter owners are prone to do, but I’m fairly hopeful I will tire of it all pretty soon. If power meter zones and watt/kg numbers are not quite your thing, I have to warn there may be a more profitable way to spend the next 3 minutes. But, then I guess if you’re already on the internet, you’re not planning on doing anything too productive anyway. So, if you’ve run out of cuddly cat videos and with suitable apologies in advance, here are some power meter readings, which may be of marginal interest. So after 3 months of endurance training / rest / bit of sweet spot/ Nov – Jan, my 5 minute peak power has fallen 100 watts. Because I don’t know much about power meters, that seems an awful lot of top end power to loose. But, on the other hand, I do this test every year, and tend to always take just under 6 minutes for the first test of the season. So compared to previous early season efforts, it’s bang on track. If you just do base endurance, you will become good at base endurance – but, no surprise, your top end racing power, will decline. Stay tuned, who knows when I will next dig in to the power meter archives! Stages power meter promise reliable power meter recording at a relatively cheap price. Whilst many SRMs can go for over £2,000. 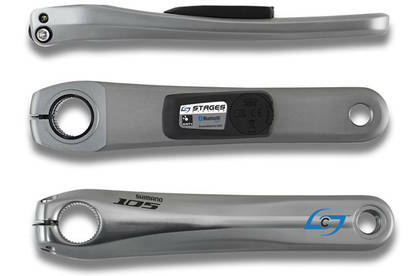 Stages power meters will be £599 (For Shimano 105) to £799 (Shimano Dura Ace 7900). Not only that but they are lightweight (20grams) and easy to switch between bikes. This summer I spent quite a bit of time researching power meters and I came to the conclusion, I wanted to get the cheapest one. For me, this was Quark, I ended up spending £1,400 and it was a big hole in the cycling budget. Firstly, the Quark experience has not been so good. A few weeks after buying (and after one race) it broke. We spent ages trying to fix the power meter reading, but the problem was in the crank arm itself so with help of Beeline we sent it back to the distributor. After a delay they sent it back saying it worked. But, it didn’t work, and they hadn’t even put a battery in it. Then we had to send back again. Eventually, four months after it stopped working (Sep 15) I’ve finally got it back in working condition yesterday (Jan 15). It would have been interesting, if not useful being able to use for the hill climb season. It was a lot of toing and froing between the bikeshop. Though in retrospective, I was glad I bought it from Beeline, as they were very helpful in dealing with the Quark distributor. Whilst the Quark was in the workshop, getting returned , I came to hear about a new power meter called Stages which you just fit to a crank arm. I soon started to regret buying Quark and thought if I’d waited I could have saved £800 and the pain of my Quark not working. Stages seemed to give everything I want from a power meter. Much cheaper than other power meters. You don’t have to worry about changing wheels / changing bikes. As long as you have same crank arm (which I do) it is quite easy to take off and put on another crank arm. This is a big bonus for me, because I have so many different bikes and wheels. Reviews suggest consistent power meter readings.